this is a picture of my post op where you can see the bald area just behind the transplanted zone. as you can see Bisanga “forgot” to put same grafts. and this is a picture taken at 6 month post op with my cell phone. bad quality but the gap between the 2 areas is visible! do you think I can undertake any legal action against his claims considering he is in Belgium and I am abroad? I want also that all people know how they act behind the forums…here they sell infomercial stuff, pics,video and they show they are good and polite, but once you are sold and you are not 100% happy, then your problems…or you have to wait or that you had too high expectations or that you have to cover the holes with long hairs !!!wtF?? I am not sure what to call you as so far I have counted I think the same post on 3, maybe 4 forums last count and all with different names. With respect if you wanted our attention you could have waited for a reply to your email you sent today, or pick up the phone, we have always been willing to talk to you. I don’t intend on making a circus out of this and bouncing from one forum to another. If the point by posting everywhere was to draw attention, I guess you have. You contacted us in April with concerns and we replied (edited email replies from the clinic below) he also asked regarding our refund policy. We asked for regular updates, a personal consultation ideally and that any future surgery we would look on very favourably in respect of costs. Dr. Bisanga advised a number up to 3000 grafts would be needed to achieve the result our patient indicated, it was the patient that capped the number of grafts to a maximum of 2600. We placed 2536, very slightly under 2600 and in no way a significant deficit to make any tangible difference. 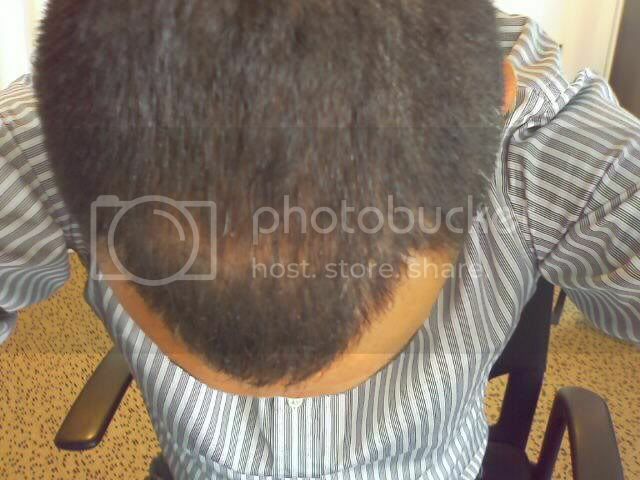 The patient was advised of the implications to lower graft count, hair line design and not being able to go back as far into his existing hair before the surgery by Dr. Bisanga, of not being able to place as far into the miniaturised hair as far as he would like; hair loss is progressive and there is no exception to this. Our patient was not proposed another surgery 5 months post op, Dr. Bisanga wished to be in contact over the next months with updates, and a personal consultation so Dr. Bisanga could assess his concerns in person rather than relying on pictures. He was told that even though the grafts were placed into the existing hair (pictures can be shown that prove this) Dr. Bisanga would have preferred to place even further back. It was explained that when placing in and around miniaturised hair there can be a contrast in quality between the two hair types, and it was said the shorter the hair sometimes the more obvious the difference. Here are sections of 3 emails with our patient in April when we last heard from him, they are replies from the clinic to him directly answering his concerns. 1st section of email reply by the clinic. “In respect of the area behind the grafted area, at your consultations it was advised the total graft should be close to 3000, this was to address the finer hair or miniaturised area and enable us to go deeper into it; and from the doctors notes he pointed out this was discussed and the concern about future loss. Your density behind is probably still high but some of the hair is miniaturised, can you confirm that you followed the recommendation and are still using meds to combat this. Sometimes and it can be especially in the early stages of growth the difference in these two areas can be exaggerated because the vast difference in calibre between the two hairs, and also the shorter you keep your hair will also show a larger difference. I look forward to your reply, apologies it took a couple of days more to get back to you; we are always here and with you, if you wish to send me updates every month you are very welcome, and even if you wish to visit the clinic please let me know. Hair line design and the number of grafts used will have a direct result on the coverage attained with a procedure, so they are relevant to each other, obviously if a number of grafts is stated and a design is made then the coverage will be determined by the distribution of the grafts, this is a reason why the doctor does not quote a specific number of grafts during consultation or even on the day, this is mentioned that the numbers may vary up or down. It was mentioned within his notes on numerous times that his recommendation was up to 3000 grafts, also that he discussed the problem of future hair loss with you and the fact you had budgeted for around 2600 grafts. You will have to enlighten me on why you mention a refund policy at the end of your email, if and when we do not give you options; please be very clear as to your reasons so there is no confusion on either side and no incorrect conclusions are made. Our door is and has always been open, so if you feel you wish to say something please do so without feeling the need to infer a future action. You are welcome to come to Brussels when is mutually convenient and Dr. Bisanga will go back over your consultation notes and day of procedure medical notes with you, examine your hair at the stage you come and answer any questions, this is really no problem. When spreading grafts you can result obviously with more coverage but less density, the impact as a result can be far less and leave the person feeling either not all the grafts grew or that they have not achieved anything great from the procedure, with more hair but no defining hair line or density behind. When spreading it has to start from the immediate hair line so this will then be thinner and with certain hair characteristics look pluggy, so the hair line has to be a certain placed density to look natural, this has the knock on effect of having to match the look of the hair line behind and drop the density placed accordingly, this has the effect on the distribution and so on and so on. If on the other hand the density of the hair line is dropped the effect is not natural but you would gain more coverage, but less density throughout, and this would be obvious. By definition a person has a hair transplant because their hair is receding, meds can hopefully help to slow this down and we can work to create as much blend with your native hair, and in your case your native hair was worked into; Dr. Bisanga again did explain the implications as he made reference to in his notes. I appreciate you have your personal feelings, and that you feel we should have been either responsible for placing more grafts at the time, even though you budgeted for 2600, the fact we placed 64 less than that would not have made any significant difference to a cosmetic result in respect of the distribution of the grafts. I also appreciate that you feel we are responsible ipso facto for a future procedure even if we did not place in an area that you could find miniaturisation continuing quite naturally due to MPB, and that even if the hair grew and in the placed area a good result was achieved. Hopefully meds work very well for you and not just stabilise hair loss but improve the calibre of your existing hair in the non grafted areas, possibly also look to use MSM and zinc as both can have a beneficial effect on hair growth, I have recently seen from people a very large improvement from using MSM especially, so the area you are concerned about may not be a concern, certainly now at the very least and hopefully long term future if you respond well. If I understand correctly at this stage you are asking for a refund against hair we did not place, nothing to do with the placement or growth of the transplanted hair, which is obviously too early to judge at present. As our patient we try also to commit long term to you, hair loss is progressive regardless how well meds work and so the likelihood of future procedures is great with anyone, and you are no exception to the rule. As this is the case we obviously are willing and happy to try and accommodate within the boundaries of reality any future hair transplant you may want or need in respect of the finances and you being a returning patient and showing a degree of loyalty to us, and assumed being happy with our work. This obviously makes sense for all concerned and hopefully it is achieved in an amicable manner as this is an emotive issue and one we recognise. At this stage I think it is very early to be judging anything as finite, especially as you have native hair that can be improved upon; I would suggest you keep us updated with pictures when you can, I think you were in Paris so if you wish to come to the clinic we can arrange a mutually agreeable time, the Thayls is only about 1 1/2 hours I think; Dr. Bisanga would be more than happy to see you and go through your concerns in person, and in person it is always easier to judge the situation as reality. I look forward to your reply and assure you the best attention. On what we have seen and not having seen him in person (and we have asked to see him many times) we draw the conclusion that in cases when the doctor advises a maximum number of grafts to be used this number is adhered to and if the patient elects to have a lower number either there is no compromise on the doctors’ amended design to accommodate the lower number of grafts or the doctor simply refuses to perform the surgery to avoid misunderstandings, disappointments and accusations. No one is perfect and we do not profess to get 100% all the time, impossible odds, but what you do is learn and not to go against what you know is right. We are happy to see you and discuss in person as we have always been.